TC Electronic Hall of Fame Mini is nice and you can choose from a wide range of reverbs using the Tone Print feature. I have a regular size Hall of Fame and love it. I recently bought a tiny Mosky Spring reverb out of interest dirt cheap. It's a blatant copy of the Malekko Chicklet - at least from the outside - and sounds surprisingly good. It doesn't like every amp's front end (can get a little noisy in higher settings) but in an FX loop or patched in something like a 5e3 it does a decent job. Btw, IMHO the Mosky sounds better than the spring setting in the Hall of Fame which I also have. I have one also, good little unit. I can try tomorrow, Vince. What amount of reverb and front or loop? OD from amp or pedal? DC: Size over sound? What kind of reverb do you prefer? The Hall of Fame's plate setting is quite good and available in the Mini version. That indeed would be interesting. Usually I go with a boss blues driver into a boss frv-1. It’s kinds ok but I have to watch the gain and volume from the od pedal. Not a lot of gain on the amp So I’m wondering if the Mosky copes better. I like the size! I just tried it in my home setting and listened carefully. Guitar -> Nobels OD -> Mosky Reverb -> Fender Vibro Champ XD (Tweed clean setting / no FX). The reverb sounds like a mix of spring and an ultra short slapback delay (which reverb actually is). When you increase the 'mix' level the level of noise increases too. Full wet might be too much, some air to the sound until half or so is absolutely fine. Increasing the dwell doesn't bring in any more noteworthy noise. Great for clean. Overdrive in front sounds good to me. The LED is very bright. The pedal is really tiny. Summary: Okay sounding reverb for adding some air. Nothing for either huge drippy surf or ambient hall sounds. We're not talking boutique quality on any level but overall better than expected for dirt-cheap. Hope that helps. I only use the first 3 settings that are all Tweed style in several gain stages with 1 being the lowest. My VCXD hums a bit but nothing too annoying. I swapped the speaker for a ceramic WGS but the improvement was very little. Same with tubes. 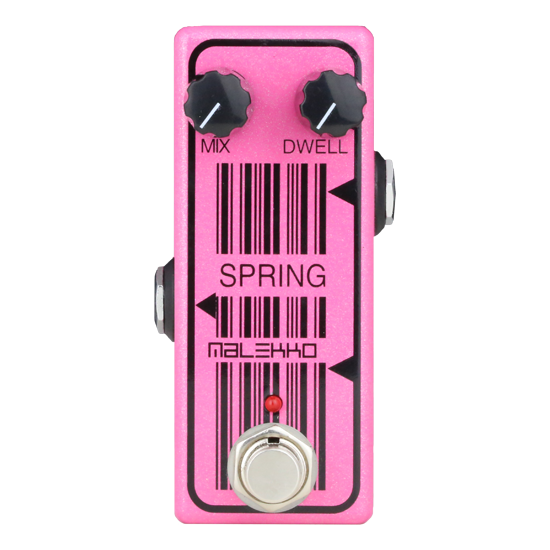 How can they call it a "spring" reverb if there's no spring involved? The shimverb is cool for sure, but definitely better for ambient as mentioned above. Also, the Mooer SkyVerb edged out the shimverb in an A/B when I had both in my shop. I think they are both good pedals, but the SkyVerb seemed to get more surfy, which is what I wanted out of it. Your mileage may vary.